Options 12 lbs 8 oz. 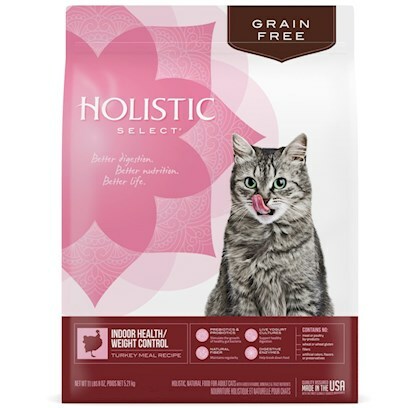 "This Holistic Select Indoor Health/Weight Control Turkey, Chicken and Herring Meals dry cat food is formulated with a unique Digestive Health Support System, including active probiotics, healthy fiber and digestive enzymes. When combined with other high quality, natural ingredients, this recipe supports the absorption and utilization of vital nutrients throughout your cat's entire body. Your cat will look and feel healthy from the inside out. Turkey Meal, Potatoes, Peas, Chicken Meal, Dried Ground Potatoes, Turkey, Herring Meal, Pea Fiber, Chicken Fat (preserved with Mixed Tocopherols), Potato Protein, Tomato Pomace, Natural Chicken Flavor, Flaxseed, Pumpkin, Menhaden Fish Oil, Cranberries, Apples, Choline Chloride, Taurine, Minerals [Zinc Polysaccharide Complex, Iron Polysaccharide Complex, Copper Polysaccharide Complex, Manganese Polysaccharide Complex, Sodium Selenite, Cobalt Carbonate, Potassium Iodide], Vitamins [Vitamin E Supplement, Niacin Supplement, Vitamin A Supplement, Ascorbic Acid (Vitamin C), d-Calcium Pantothenate, Riboflavin Supplement, Pyridoxine Hydrochloride, Thiamine Mononitrate, Vitamin D3 Supplement, Biotin, Vitamin B12 Supplement, Folic Acid], Papaya, Blueberries, DL-Methionine, Pomegranate, Mixed Tocopherols added to preserve freshness, Salt, Glucosamine Hydrochloride, L-Carnitine, Potassium Chloride, Inulin, Ground Cinnamon, Ground Fennel, Ground Peppermint, Yucca Schidigera Extract, Dried Lactobacillus acidophilus Fermentation Product, Dried Lactobacillus casei Fermentation Product, Dried Enterococcus faecium Fermentation Product, Dried Bacillus subtilis Fermentation Product, Dried Bacillus licheniformis Fermentation Product, Dried Aspergillus oryzae Fermentation Product, Dried Aspergillus niger Fermentation Product, Lecithin, Rosemary Extract. Your Cat’s Weight Maintenance Weight Reduction Lbs. Kg. Cups Grams Cups Grams 4 – 6 1.8 – 2.7 1/3 – 1/2 38 – 57 1/4 – 1/3 28.5 - 38 6 – 8 2.7 – 3.6 1/2 57 1/3 38 8 – 10 3.6 – 4.5 1/2 – 2/3 57 - 75 1/2 57 10 – 12 4.5 – 5.4 2/3 – 3/4 75 - 85 1/2 – 2/3 57 - 75 12 – 14 5.4 – 6.4 3/4 85 2/3 75 Standard measuring cup holds approximately 4.0 oz (114 g) of Holistic Select Indoor Health/Weight Control Turkey, Chicken and Herring Meals Recipe. Cats over 14 lbs (6.4 kg): Add approximately ¼ cup (28.5 g) for every 4 lbs (1.8 kg) over 14 lbs. Combination Feeding: If feeding with wet food, reduce dry amount by ¼ cup (28.5 g) fed for every 3 oz (85 g) of wet food.